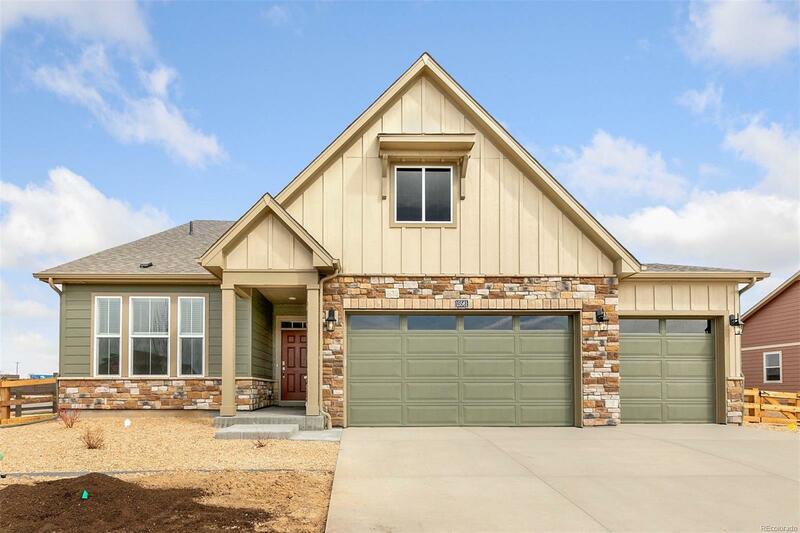 New home with builder’s warranty! Corner lot w/ Views! Beautiful ranch w/ a FULL FINISHED BASEMENT w/ extended ceiling height & 3 CAR GARAGE. This beautiful home features 4 bedrooms + Flex Room, 3 bathrooms, along with gorgeous finishes including hard surface floors, cozy fireplace, quartz countertops throughout bathrooms, white cabinets & slab granite in this gourmet kitchen with stainless steel kitchen appliance package including a designer vented hood, gas cooktop, built in wall oven/microwave combo & dishwasher. Ample closet space & storage throughout. This home also includes the Smart Home package featuring the Amazon Echo, Echo Dot, Sky Bell video door bell & more. Don’t miss the Rinnai tankless water heater; one of the energy efficiency features of this new home. Perfect home for entertaining indoors & outdoors with a covered patio to enjoy all year long. Includes a fully fenced yard with front & backyard landscaping/sprinkler system.